Lime’s introduction of bikes last year following its scooter debut will factor into regional standards for the Wasatch Front. Whether by scoot or by pedal, the dockless harbingers of treacherous sidewalks are here to stay. Months after the electric scooters showed up in Salt Lake City, "micro mobility" company Lime went in for a one-two punch and unloaded a fleet of next-generation bicycles on icy city streets last November. The green, electric-assisted bikes operate just like their scooter cousins. The bikes unlock via smartphone and can be dumped almost anywhere around the city—with some exceptions, such as on public right-of-ways—once trips are completed. Residents have learned to live with the scooters, but the bikes have added another wrinkle to the dockless-device conundrum facing cities across the country. 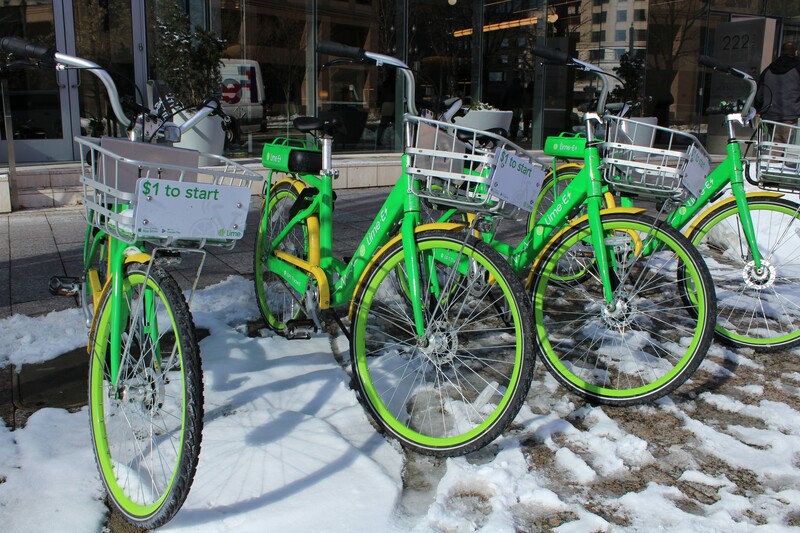 As any downtown denizen can tell you, Salt Lake already has its own bike-share program, GreenBike, which relies on docking stations unlike its dockless counterparts. Related Get Off the Road! : Electric scooters have descended on our sleepy metropolis—and not everyone is happy. Currently operating in 19 and 22 states, respectively, titans Bird and Lime have swept the country and quickly become as ubiquitous as they are controversial. GreenBike's founder and executive director, Ben Bolte, says there aren't any plans to dip into the tempting dockless nectar. "There's a reason the private sector, venture capital-based companies are doing the dockless-based model," Bolte says. "Because when you're using community buy-in, public dollars and sponsor dollars to put these products in, there's no way anybody would be OK with the concept of 'Oh yeah, just be able to leave it anywhere.' Everybody would have lost their minds. "It was hard enough just to find locations for the stations and let people know, 'It's fine, anyone can take it.'" Bolte says he does "not want to be polarizing" when it comes to the dockless debate. His nonprofit program has been around since 2013 and sold its highest number of memberships last year. When it comes to community buy-in and polarization potential, it's toed the line carefully. As for dockless bike initiatives, look to just a few other cities to see what's transpired. New York City Mayor Bill de Blasio called the electric bicycles "a real danger," The New York Times reported. The city confiscated hundreds in 2017, which set up a clash among residents, the city council and companies such as Bird and Lime. A coast away, the number of e-bikes seemingly dwindled from spring to fall last year in San Diego, Calif. In August, hundreds were spotted piled up at a recycling center, though the bike-share company Ofo played it off as a routine part of operations, according to The San Diego Union-Tribune. Now, Ofo is on the verge of bankruptcy, and photos of thousands of bikes at scrap metal facilities have made the rounds online. 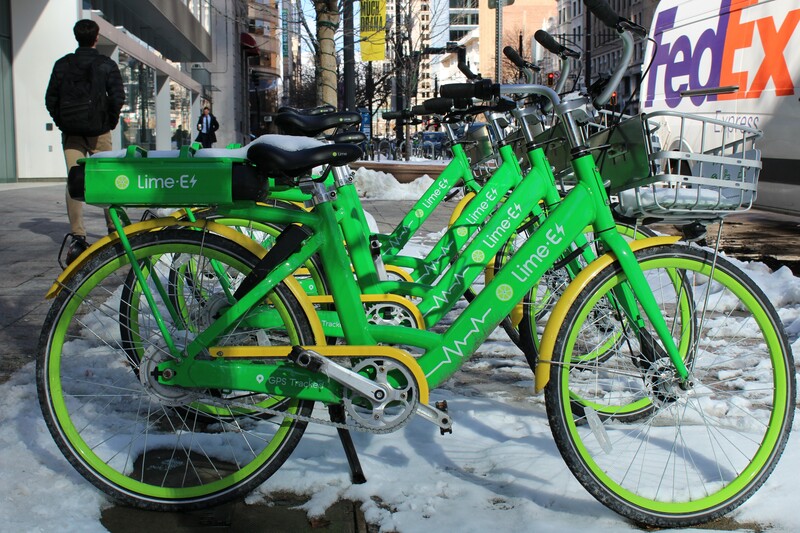 And in St. Louis, Lime's bikes showed up in spring 2018 but disappeared almost entirely in the following months, according to the St. Louis Post-Dispatch. The bikes were later found stored five high with broken wires and seats awaiting repair. The bikes were being replaced by the company's scooters. 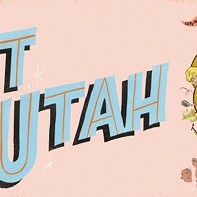 You might be thinking, "This is Utah, dangit! We're different." 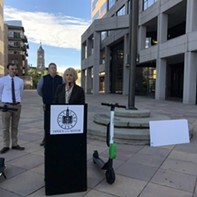 In keeping with the state's industrious past, and perhaps applying lessons learned during the e-scooter fiasco, municipalities along the Wasatch Front seem to be taking a long-term approach—all the while looking to Salt Lake City as a model for regional standards when it comes to dockless devices. Perhaps, if done right, area cities will avoid headlines such as "Land of Misfit Limes" or "Push to Legalize E-Bikes and E-Scooters Sets Up City Hall Clash." 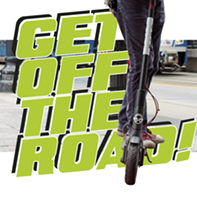 The Wasatch Front Regional Council has formed a shared mobility-device task force to help bring the numerous governing bodies together and address concerns about the spread of the devices. "Is there a way all the communities can be on the same page?" Jory Johner, director of long-range planning for the WFRC and GreenBike board member, asks. Some cities allow the devices to be "scattered around" he says, while others require them to be left in designated sports. "If everybody can kind of get on the same page, it helps everybody with enforcement, with knowing what requirements are out there, what expectations they have, things like that." Millcreek Mayor Jeff Silvestrini tells City Weekly that once the scooters started popping up in Salt Lake last year, he started getting calls from businesses in his jurisdiction telling him they were showing up there as well. 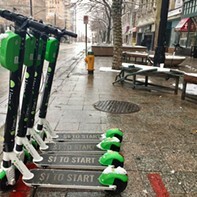 Now, more than six months later, Silvestrini says the city is nearing an operating agreement with Bird to officially welcome the scooters inside city limits. "The main thing as municipalities that we're interested in is that the companies are responsible," he says. "And they're compliant when these devices are stacked up or knocked down—basically they're responsive to them. I think it's in all of our interest to have some uniform rules for how they operate so you know you can ride on the sidewalk or you can't." The spread of the scooters and bikes was inevitable. The charges the devices hold help riders get to longer-distance destinations. Hugh Van Wagenen, another member of the WFRC's long-range planning team, says "clearly, users are taking them where they're needed." Van Wagenen says the impetus for the council's new task force arose soon after the devices stretched outside of Salt Lake's city limits. "We're certainly excited about providing additional transportation choices for everybody in our region," Van Wagenen says. "We're also excited that we can be a convener and bring all these groups together as a regional entity." Jon Larsen, Salt Lake City's transportation division director, who also serves on the GreenBike board of directors, says it appears dockless Lime bikes are here to stay, at least for now. According to the operating agreement with Salt Lake City last year, bikes and scooters are both included as part of the 500 devices companies are permitted to disperse within city limits. Unlike some of the aforementioned cities, though, scooters showed up here first, possibly contributing to the tempered public reaction when the bikes appeared. "There hasn't really been a lot of outcry," Larsen says about the influx of dockless bikes. "I think a lot of people are kind of, like, 'Oh, there's bikes now. OK,' and it seems like the launch timing makes sense to test out bikes in this market during the winter. Bikes are going to do better than scooters if it's snowy." Larsen ultimately says they'd like to figure out how to have the dockless and docked models operating cohesively, but there is some worry about confusion. Larsen says some riders could be confused since both are green, and Bolte mentioned that when the bikes first rolled out, some were trying to dock Lime bikes in GreenBike stations. But Bolte cautions against any hastened changes to its infrastructure to align with what's hot. "We still don't know what the regulatory environment is going to be for these products," Bolte says. "Dockless is a very volatile space." Lime did not respond to multiple requests for comment for this story. Whether it's from national conglomerates or local companies, don't be surprised to see more bike- and scooter-sharing programs along the Wasatch Front in 2019. It just might be about who gets there first. "We've been talking about how to regionalize these services for years, but the problem has been that it's expensive. Some cities don't want to use grant money to fund that [and] it's hard to come up with sponsor dollars," Bolte concludes. "Different communities have different needs, and we're certainly not going to be able to go everywhere."